Have y’all ever made up a recipe before and it was just like omgthisissogoodiamabeast!? I totally had a moment like that this week. Okay, well, the recipe was inspired by another, but I feel it was just enough different for me to claim ownership! Haha. So today I bring you my Clean Eating Thai Stir Fry Recipe! Anyway, as you all probably know, we have been on a clean eating kick for a while now. I have loved trying new recipes and figuring how to reinvent different things. For example, this recipe was inspired by one of my favorite dishes, pad thai. Gosh, pad thai, how I love thee. The luxurious noodles and crunchy peanuts aren’t exactly waistline-friendly, so some substitutions need to be made. I recently discovered broccoli slaw and I kind of love it. It’s crisp and refreshing. I have been throwing it on top of salads for added veggies and it does awesome in a stir fry. You can usually find it near the packaged coleslaws in your grocery store. I’ve never actually tried it with coleslaw dressing, so I can’t tell you how it performs there. And for this thai stir fry recipe’s purpose, the broccoli slaw acts as the noodles. Sounds weird, but I promise you it’s tasty. When I cook, I kinda just throw stuff in the pan, and I don’t measure very much (unless it’s baking). So you can definitely adjust any of the ingredients to your tastes and preferences. Most of the ingredients used in this thai stir fry recipe are organic, but if you can’t find it, no big deal. You can most certainly take out what you don’t like and suit it to your tastes, or make substitutions. You’re gonna wanna pin this one! Promise! Heat a wok (if you’re fancy like me) or pan over medium-high heat. Add oil and garlic, cook about 1 minute. Add chicken and cook 2-3 minutes or until lightly browned. Pour a splash of the coconut milk over the chicken and cook about a minute. Add soy sauce, lime juice, and vinegar. Cook until chicken is completely cooked through. Add the package of broccoli slaw. Pour a little more coconut milk in if desired. Cook, stirring frequently. Add the PB2, and stir (I add this at the end so I don’t over do it – add the PB2 little by little so it is suited to your level of peanut taste). Cook until slaw is soft but still firm. Garnish with a lot of chopped cilantro and green onion. Squeeze some more lime juice over it, if desired. And some Sriracha, because you can, and Sriracha is sent straight from heaven. This one was definitely a winner in our house. Good enough to add into the rotation! I didn’t even miss the noodles, because the broccoli slaw was so yummy, perfect, and filling! 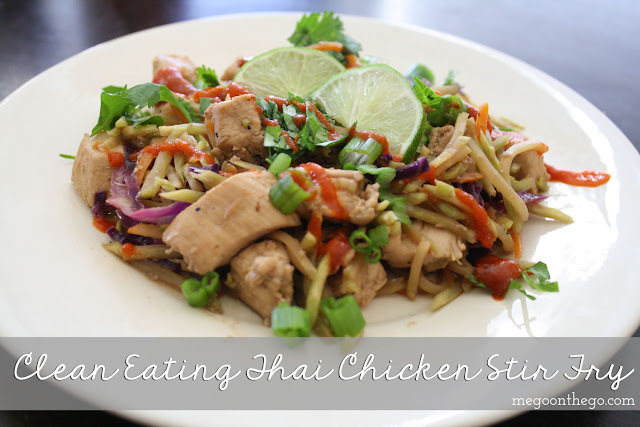 If you try this thai stir fry recipe, let me know what you think! This might be a dumb question, but when adding the PB2 are you doing just powder or already prepared? I add in just the powder! Thank you for this recipe! My family (including 3 y/o) loves it. I add a thinly sliced red pepper, and since we don’t follow a paleo diet, some brown rice spaghetti to make awesome noodle bowls. Thank you so much for sharing. I made this last night and I love it! I want to make this Sunday, it looks so good! How many servings (how big is a serving) does this make? Do you, by chance, know the nutritional facts? Can’t wait! This was amazing!! So freaking good!!! I loved a lot about this recipe but thought it had too strong of a vinegar flavor. Loved the idea of using the slaw in stir fry because it really reduces the prep time but would use less vinegar next time. Other than that, it was great! I really like my Asian food on the tart side, so I can definitely see why you may have felt that way! Thanks for the feedback, and I am glad that you enjoyed the recipe otherwise! How many servings is this dish? Wow! I think this has become one of my new favorite meals! I loved all those flavors mixed together. Unfortunately my husband hates coconut and said that’s all he could taste (while I couldn’t taste it all). We will definitely be trying again with olive oil, not sure what to sub the coconut milk with though. Thanks for a yummy dinner! I’m glad you love it!! I love that it’s easy, quick, and super flavorful. Definitely try with olive oil and see if that cuts down on the “coconut-y” flavor. I wish I had a suggestion for the coconut milk, though! Ohhhh mygosh this is WONDERFUL! So delish!